Thanks to your generous support, last winter we purchased a large house in Whitesville and, after months of labor, we moved in this past spring. Now we are working to transform our home into a radical community space in the heart of coal country. Come visit or (even better!) volunteer with us! Thanks to this investment in the future of the Coal River Valley, we have plenty of room to support short or long-term volunteers. In addition to our new house, we strengthened our ties to the Coal River Valley through community projects. This past year, we started a community garden in Whitesville. We’ve started small but are planning to grow in the spring. We have hosted several community events- including a herbal health clinic in Whitesville and our annual Fall Summit up on Kayford Mountain. We have also continued to address the ongoing water crisis in West Virginia by providing support to communities with no access to clean water in Prenter and on top of Kayford Mountain. Through our work with the Kanawha Forest Coalition, our disaster relief work in the Elk River Valley and our prisoner support and advocacy work, we’ve supported grassroots work outside the Coal River Valley in southern WV as well. A huge shout-out to friends and allies with the KFC, whose tireless efforts opposing the KD#2 mine led to the state withdrawing their mining permit. And another shout-out to the Roush family who worked so hard to support and help their neighbors rebuild their community in the wake of the devastating floods in southern WV this past summer! 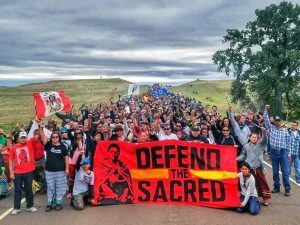 This past summer and through the fall and winter, RAMPS members supported direct action against the DAPL pipeline in support of the Indigenous resistance at Standing Rock. Despite the bitter cold and the police brutality, warriors remain encamped at Standing Rock to oppose construction of the pipeline and reclaim treaty land. RAMPS members continue to support this resistance as it evolves. As we enter a new chapter in 2017, our commitment to building power in West Virginia and beyond feels more important than ever. Recent events (including the rise of Trump) have only confirmed our belief that resistance and liberation must be found in the streets, the hollows, and the prairies- a belief that increasingly means risking bogus felony charges, as RAMPS members are facing in DC and ND. We cannot continue to do this work without your continued support! Feel free to get in touch, come visit, or donate to support our work! This entry was posted on Monday, February 13th, 2017 at 10:43 pm	and is filed under Campaign House, Kanawha Forest Coalition, personal statement, Solidarity, Standing Rock. You can follow any responses to this entry through the RSS 2.0 feed. You can skip to the end and leave a response. Pinging is currently not allowed.